The primary theme of this celebration is a wonderful combination of complimentary soft greens paired with chocolate and wheat. The bridal bouquet combines pale green orchids, tulips, and nurines in a classic bouquet. Modest table arrangements of a similar style are neatly bound by organic twine - a twist to your classic white satin ribbon. I love the use of the artichoke as a vessel for candles - this unique and fun element also looks great when added to formal flower arrangements. Rustic lanterns surrounded by river rock are a great functional accompaniment to this overall design. 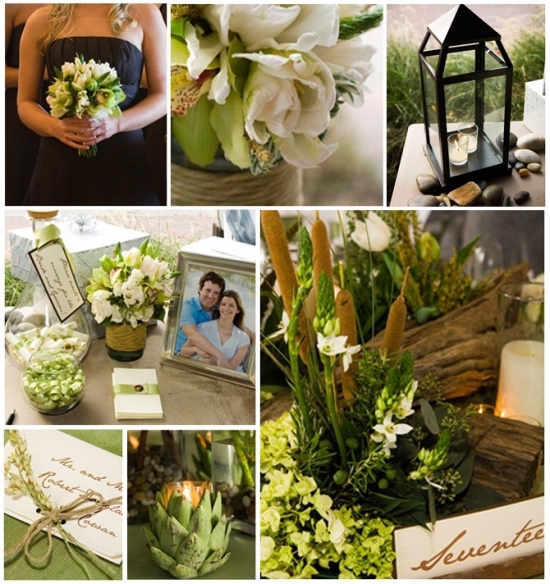 The table arrangements are comprised of drift wood with cattails, bouvardias, and viburnums. These clever arrangements surround a trio of pillar candles and votive. The detail in the guest book is wonderful, the ultimate message in a bottle. This creative and unique idea makes a great mantle decor until you are ready to read all the well wishes from your wedding guests. There are so many different ways to style a color palette primarily consisting of Moss Green, Granny Smith, and Coco Brown. These colors look amazing in any garden setting accented by ivory and ecru. There is a current trend leaning towards a 'barn' wedding and these colors will blend seamlessly. The Mill Valley Outdoor Art Club features these colors well and they would look great at the Brazilian Room in Tilden Park. You may also consider a similar style at Barn Diva or The Headlands Center for The Arts.